M. Jean Duchesne cofounded the French edition of the Communio international theological journal and served as special assistant to the late Cardinal Jean-Marie Lustiger of Paris for more than 25 years. 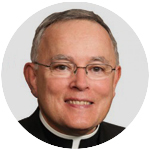 The author of numerous books and articles on the faith, active in Jewish-Catholic dialogues, and a consultant to Lustiger’s successors, he has been a friend to the Church in the United States for decades. He and his family live in Paris. I’m grateful for his willingness to offer his thoughts here on the Paris Holy Week fire. IMPORTANT NOTE: Notre Dame de Paris is a symbol of faith that belongs to Catholics around the world. Many of our parishes will be conducting a Second Collection on Easter Sunday to help repair and rebuild Notre Dame Cathedral. Please be as generous as your means allow. Please pray for the Catholic community in France, and may God bless all of us with a holy Triduum and joyful Easter. Seeing Notre Dame de Paris burning and threatening to collapse was a shock that left everyone voiceless – including President Emmanuel Macron, who canceled a speech dealing with the social unrest in France over the past few months. It is also a vibrant reminder of the faith of our ancestors, which shaped the monument and inspired every detail as a facet of God’s revelation and gifts as well as the overall design. It was meant and has survived as a representation of the celestial abode that everyone openly hopes for or secretly dreams of. That something so ancient should defy time and remain so mysteriously meaningful is perceived as a miracle that no science can either deny or explain. This is why even non-believers feel affected. The Paris cathedral is the symbol not just of the Catholic faith, but of the fact that all humans have souls.